“It is again with great reluctance that the Court concludes that plaintiff’s claims are preempted by the foreign affairs doctrine, realizing the effect that this decision may have on victims of the Holocaust and their descendants,” U.S. District Judge John F. Walter wrote in regards to the amended claim to recover Nazi-era looted art. The claim was brought by Marei Von Saher, granddaughter of the famous Dutch art dealer, Jacques Goudstikker against a California museum that purchased a work in dispute in the 1970s. This is a second order to dismiss Von Saher’s claim to recover a diptych attributed to Lucas Cranach the Elder, now on display at the Norton Simon Museum in Pasadena, California. The painting was in the Goudstikker collection since 1931; it was looted by the Nazis after Germany invaded the Netherlands. The decision seems to be the final chapter to the valiant efforts by the Goudstikker’s heirs, dating back to 1996. Having failed to recover the painting or its value from the Dutch government, Von Saher, sued the Norton Simon Museum in 2007 for the painting, basing her claim on state law which extended the statute of limitations for recovery of Holocaust-era looted art until 2010. 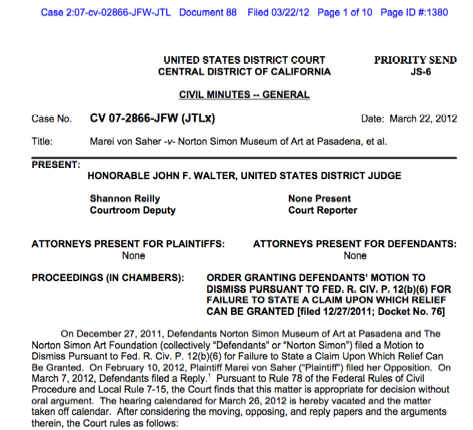 For the latest update on the case, read Courthouse News Service or Walter’s opinion in Marei von Saher -v- Norton Simon Museum of Art at Pasadena, et al., CV 07-2866-JFW (JTLx) (D. Calif., March 22, 2012). For procedural history, read Supreme Court Nonplussed by Claimant Endeavor to Recover Art in Von Saher v. Norton Simon Museum of Art.